You already know how much I adore my PC games or any other type of games for that matter. I live for games and I never tire of finding new cool ones to satisfy my game addiction. In fact, I find the casino online especially interesting and hard to resist. I've never tried playing the real thing but that's okay considering the huge stack of casino PC games in my possession to satisfy my game addiction. Having said that, the exciting pull of casino games online does call out to me at times, which is the reason why I am constantly looking for new games. I figured if I am not brave enough to go for the real deal, I can always practice my skill at Slots, Poker or Blackjack the safe way, via games! 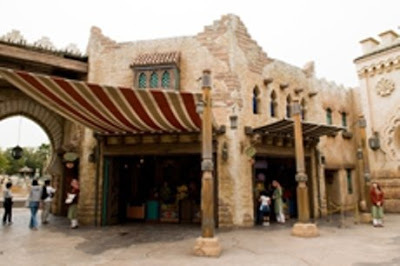 So when we visited DisneySea in Tokyo, the first location we headed for was the Arabian Coast. I had read up on the resort earlier and found out there were several games for me to play! What comprised the prizes was pure mystery, which naturally ignited my curiosity further but anything from the Arabian Coast would sure be amazing. 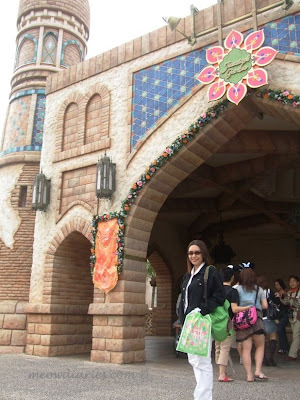 Plus, enjoying my favourite hobby of playing games, casino or not, would feel even more exciting at magical DisneySea! We happily checked out Arabian Coast where we found a cool game shop in an old building in a corner of the market. 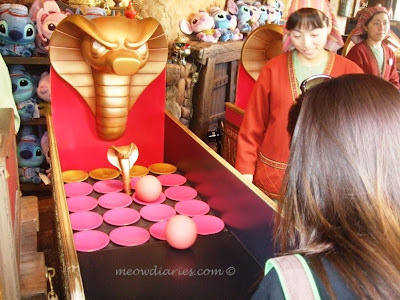 Run by Aladdin’s pal Abu, there were two games for us to try namely The Cobra’s Trap and Journey to the Palace. I was already excited while queuing up and was determined to win something as a memento of my DisneySea trip! I had my eye set on winning the pink doll. I don't know her name but she's a friend of Stitch apparently and they're both donning Arab wear! I took a shot at The Cobra's Trap first. In order to play, I paid 500 yen for three balls and three throws. To WIN, all I had to do was roll the ball all the way to the end line of the waiting golden plates. If a ball lands on any of the golden plates successfully, I'd win! Master did not WIN but I did get a genie pin as consolation prize! After thrice playing and losing, B stepped in to my rescue and he tried his luck at the second game. 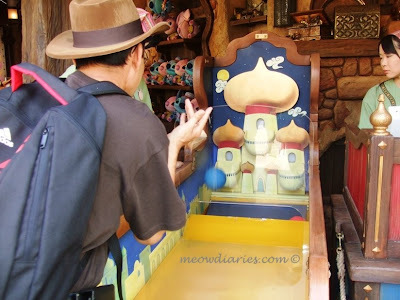 Journey to the Palace is similar in concept but this time you had to throw the ball and if it lands inside one of the palace balconies, you WIN! The first try saw the ball bouncing off the balcony and since B only had two shots left, I scurried over to give him moral support; loudly cheering him on to win me a doll! The winning shot, thanks love! Luck was on our side and B's second throw was PERFECT! Everybody cheered and clapped when B won and I was asked to choose between the two dolls as my prize! Of course I choose the pink doll; check out her Arab costume in lime green! 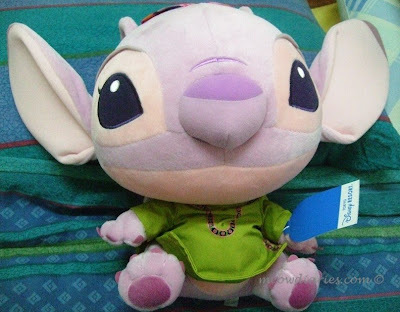 We left Arabian Coast happily, me hugging my new doll. I was thrilled that B won me something, which was sufficient to satisfy my need to play games at DisneySea. I just wanted to win something and B did that for me so I was one happy camper! On the way to our next attraction, we spotted Mickey...in Arab costume! Naturally, we stood in line and waited to have our picture taken with Mickey! We were patient; even when Mickey took a break from picture taking to get a drink, we stayed put. There was no way we were going to miss out on having our picture taken with Mickey Mouse! We waited about 20 minutes to finally have this picture taken but Mickey was worth the wait of course! I didn't mind waiting at all, which was so unlike me but hey, I won, I won so nothing was going to spoil my day! uh-oh.. gtg. J bising already because i insist on trying to chop!! LOL! we're supposed to go out ni. See ya later!!!! :) :) and hi mon!!!!! Yeeeha! Thanks for stalking Monica! its like becoming a kid again! Oh it’s not easy to meet Mickey, so we were thrilled!!!! LOL!!!! Yeah la this B, so good at games unlike me! Everything I played kalah but he won something for me twice! Welcome Mon! 4 points edi for u! Actually it’s a light shade of lavender, but still goes well with the lime green outfit, I love!!!! LOL, sure Mon! Hey I got la that SS PB! Yeah, but only this morning they confirmed it. I reserved twice!!! U did urs edi????? Reserved edi? And they didn email today saying u got the job??? no they didnt email me today! Oh, what fun... and you won! I enjoyed all the pictures and I'm here to VOTE VOTE VOTE! 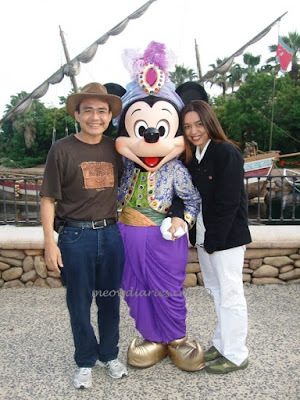 sounds like you had a blast and i love your prizy and the last capture with mickey. ohhh big grats to you Mariuca...such a cute dollie .. ALAKAZAM!! GP!!!! Sounds like you had a great time in a place that sounds like the Land of Faraway LOL I still haven't taken Ellie to Disney HK yet...but not for lack of trying! We'll get there some day...soon!! Cheers! !